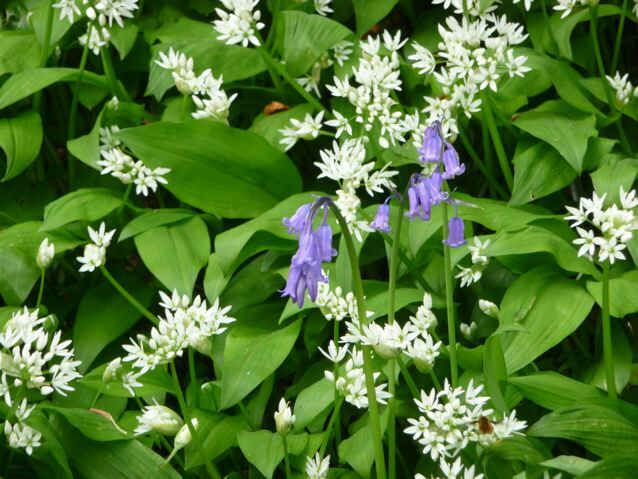 The south-west and west of England are a good place to find wild garlic (allium ursinum) though I have seen it growing along the banks of the River Cocker in Cockermouth, tucked in the damp trough of the old Mill Race. If it likes a spot it will surely but slowly colonize the ground. It likes damp and it likes light dappled shade, and it comes into flower more or less as the trees start to leaf up, though you can pick the leaves much earlier in the year when it first emerges. Once the canopy has filled out and the trees are in full leaf overhead, the leaves shrivel and the wild garlic plants set seed and vanish for another year. You can also buy bulbs from suppliers on the internet if you want to try growing it in your garden. I first came across it many years ago as a student when I walked from Wooton-under-Edge to Bath on part of the Cotswold Way with two friends, much fitter and light of foot than me. It was a hot weekend and I was glad to get out of the bright sunshine in the cow pastures and bridleways and walk through a cool green wood for a time. The pungent and distinctive smell of garlic was everywhere, starry white flowers drifting up the slopes, with bluebells and cow parsley layered in. I remember wrinkling my nose and saying, ‘But that’s garlic!’ I think I thought then that garlic only grew in warmer Mediterranean countries. The memory stayed with me for many years and when I moved to Bristol eight years ago and found it growing in almost every damp woodland here I researched it, realised it was edible and now pick some every year to use in my cooking. It has become very trendy and fashionable and is sold at farmers’ markets in London and around the country. If you were in one of these woods in January you wouldn’t really believe that come May they can be carpeted with garlic, I reckon it is one of the safer plants for the beginner to pick and eat as the smell of the leaves is so distinctive, having said that bluebells and anenomes are poisonous so do make sure that you can distinguish between them. I have read also that some people confuse lily of the valley with wild garlic. I have never seen them growing together here, but again it is worth bearing in mind. I have some older posts on this blog with close up photos but if you search internet images you should find many photos and descriptions to help you. It is worth noting that the plants do vary in size. The ones we picked yesterday were very big and tall, but the ones I see more locally are shorter and smaller. The plants die back in the summer and all that are left are the bulbs hidden underground till next year, so it really is very seasonal. I haven’t picked much this year, just one lot that I used in the semolina bun bread last month and at the weekend on our walk I thought I would grab a dog bag’s worth and make some pesto to put in the freezer as the ‘season’ is almost over. I can tell you what I did and what I put in it, but I haven’t got really good quantiities for you as I made it by eye and taste. Pesto is one of those Humpty Dumpty words these days as people seem to put what they like in it, some people leave the cheese out altogether, some people add lemon, but it is a convenient word so I use it here. About 150 g of coarsely ground hazelnuts, I like it a bit chunky! It seems a waste to put expensive pine nuts in there as the garlic taste is so strong I don’t think you would be able to taste the pine nuts to be honest. We put the garlic in the food processor and added olive oil until the leaves were chopped up, then added the other ingredients and held back on the oil to make a thick creamy paste. I don’t like pesto when it it very oily. I then spooned it into little 2.5 cm tubs and put them in the freezer. I have read that some people freeze them in ice cube trays and then pop them out and store them that way, but it is one more process and I am a lazy person! I had held back a handful of leaves and Brian made this wonderful dish which we had for supper with the Black Badger peas that I had cooked a few weeks back and frozen. The Black Badgers have quite coarse skins but these seem to have softened up in the process of being frozen and defrosted and I think they are fantastic. Brian came up with this which reminded me of really good hippy food from the 1970s and 80s -think Cranks, and Food For Thought and the Hare Krishna restaurant on Soho Square. We ate them with a piece of Cumberland sausage and some pita bread and some steamed purple sprouting broccoli. Cover with lid and check from time to time that there is liquid in the pan, top up if necessary, but you only want enough to stop them sticking, not swimming! Bake your flat breads – I made pita once more, such fun making pita bread so any excuse! Before you serve, take the pan off the heat add the grated Pecorino and stir in, put the lid back on and leave to melt in and through the dish. If you can’t get Black Badgers, you could make something similar with locally grown peas or beans. They are full of good fibre and protein and often overlooked in favour of perky fresh vegetable; we lived on dried pulses in years past in this country, survived on them through the winter and the hungry gap when the new crops hadn’t come through yet. What were the traditional winter foods where you live – before the days of freezers and 24 hour everything available all the time shops? This entry was posted in Dog Walks, Out and About, Plants and Trees, Wild Food and tagged black badgers, dog walks, foraging, springtime, supper dish, wild garlic pesto on 13/05/2013 by Joanna. You can see the stiff levain just after it has been mixed in the righthand bowl, this is mixed using more flour than water to form a dough like consistency, as opposed to a liquid levain which uses more water than flour. The liquid ones ripen faster and tend to be more acidic in taste in my experience, the stiff levains are milder in flavour. It is easier to mix the liquid ones into the final dough. If you are mixing by hand the stiff levains can be tricky to mix in so that you don't get a patchy crumb, something that happened to me a lot before I got a stand mixer. This entry was posted in Bread, Mellow Bakers, Wild Food and tagged Jeffrey Hamelman, Mellow Bakers, Roast Garlic Levain, wild garlic pesto on 11/01/2012 by Joanna. 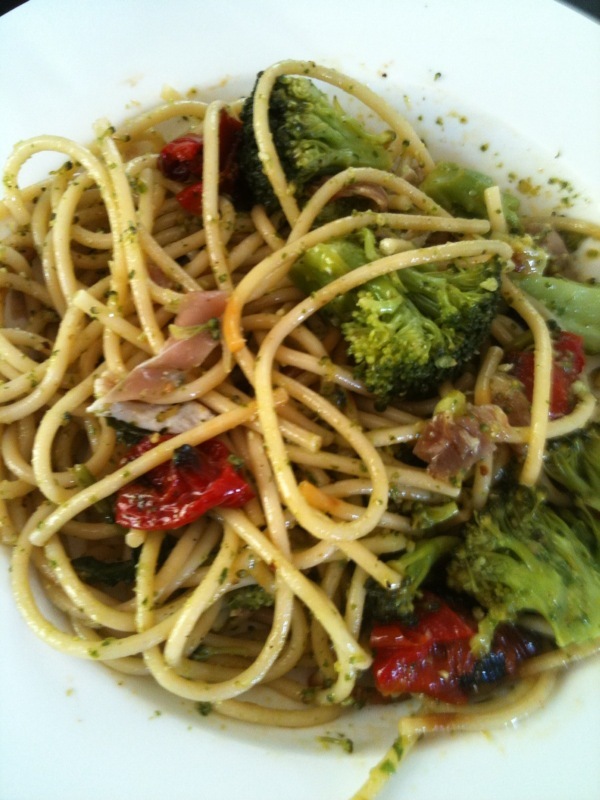 Lynne has sent me this great pic of her wild garlic spaghetti dish! take a few handfuls of wild garlic, a handful of pan roasted almonds, juice and rind of 2 lemons and a glug of olive oil and a teaspoon of salt…pulverize to within an inch of its life in the processor (otherwise it seems to be just too fiery) and keep in jar in the fridge. Very hard to not just keep on eating it. It looks delicious Lynne! Thanks for sharing the recipe and your photo. I’m going back to the woods tomorrow to get some more… When I went today I noticed it was in full flower and the air was sweet and pungent with bluebells and garlic, what a great combination, an opportunity for an enterprising perfumist or a Heston Blumenthal icecream…..
It’s all flowering now so the season will be over soon! Gather ye garlic while ye may…if you’re not sure what it looks like, here is my best close-up shot to help. 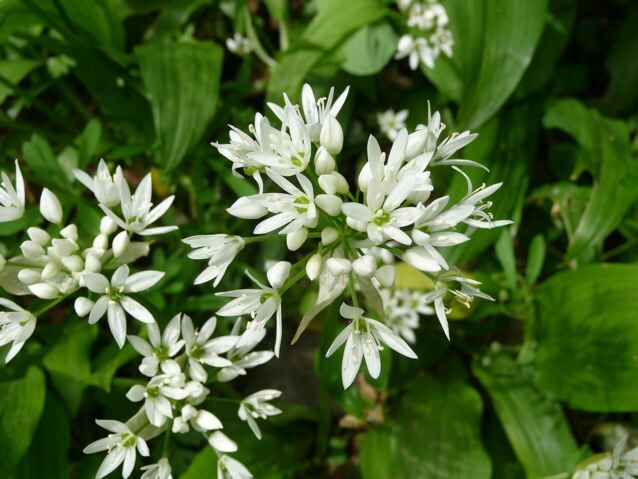 This entry was posted in Dog Walks, Plants and Trees, Recipes, Wild Food and tagged foraging, wild garlic flowers, wild garlic pesto on 27/04/2010 by Joanna.